Nolan Ryan, The Ryan Express, blew through opposing hitters for 27 years, accumulating 5,714 strikeouts and 7 no-hitters, both MLB records. An intimidating force on the mound, Ryan was an 8-time All-Star, was named to the All-Century Team and was a 1st ballot Hall of Famer inducted in 1999. For the Rangers, Ryan twice led the AL in strikeouts and threw 2 no-hitters. This photo was taken on September 8, 1990 after Ryan was hit by a line drive by Bo Jackson. Ryan stayed in the game pitching 7 innings as the Rangers won 2-1. In Ryan's last game, his last pitch was clocked at 98 MPH. 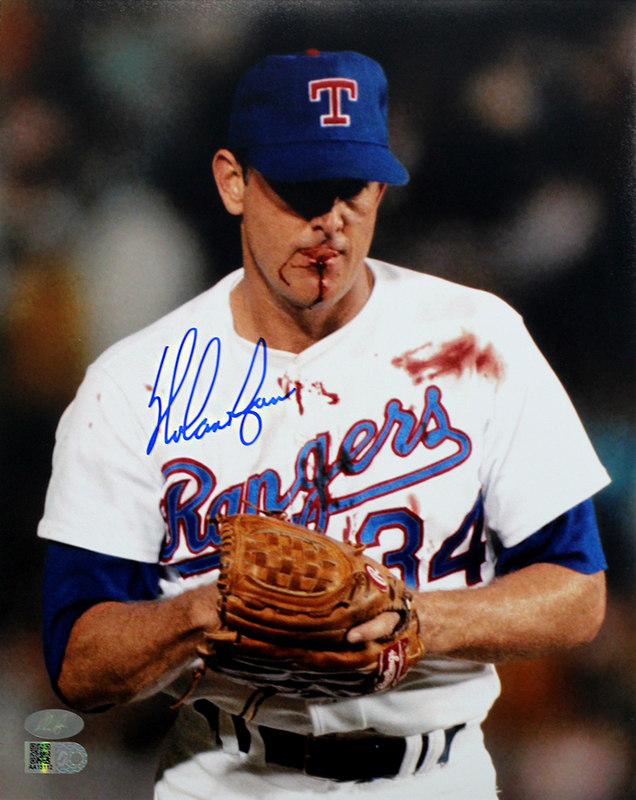 Nolan Ryan has autographed, hand signed this famous Texas Rangers Bloody Lip 8x10 photo. Each Nolan Ryan autographed photo is guaranteed authentic, and includes an individually numbered TRISTAR Authentic hologram. You can verify the authenticity of your autograph by entering your hologram number online at www.tristarauthentic.com.